Energizer has worked for several years to raise awareness of the issue of coin lithium battery ingestion. In late 2012, the company led the industry by becoming the first to voluntarily redesign its 20mm coin lithium battery packaging to comply with the ASTM D3475 child resistant packaging standard and recommendations for the use of child-resistant packaging made by the staff at the U.S. Consumer Product Safety Commission (CPSC). The packaging features stronger, more durable and flexible materials that make it very difficult for a child to open. The batteries are also packed in individual compartments so you can use one battery and leave the other safely secure within the package. Energizer also added a new icon to the front of the package that warns users to keep the batteries out of reach of children, and new back panel copy emphasizes the potential hazards of swallowing the batteries and provides instructions on what to do if swallowing occurs. To comply with strict child-resistant packaging standards, the packaging was tested with groups of children of varying ages to make sure they couldn’t open it after a prolonged effort. In August 2013, Energizer engaged Blick&Staff Communications to develop a campaign to educate parents and caregivers about this cause and gain credit for Energizer’s leadership in child-resistant packaging and family safety. 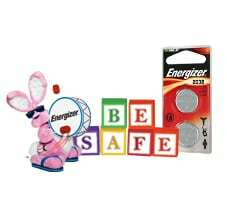 Together, they developed the “4 S’s of Coin Lithium Battery Safety” campaign—focused around four simple steps any parent or caregiver can take to help prevent coin battery ingestions and keep children safe, including recommending they choose packaging that meets federal guidelines for child resistance (established by the CPSC).